okay, yes King has some chemistry but are you all forget what he did with his first wife and unborn baby? How like that can forgive? I like bad gays but he is worst! I hope Sunny do not forget that. Yeah sure we dont know rather he was the one that actually killed her but he did try to choke her and push her in the water he is an abusive person and really horrible to all of the women in his life. Yeah sure we dont know rather he was the one that actually killed her but he did try to choke and push her in the water he is an abusive person and really horrible to all of the women in his life. Yes maybe its not him who killed her but he helped to do it, like he helped killed WS's mother. So he must pay for this. Did I missed something? Wasn´t it shown in a flashback that she died because he pushed her into the water..so how is is not sure if he killed her? Nope it wasn't shown. We only saw LH pushing his wife into the pond and leaving while she was still alive. So there is still a chance someone drowned her by force. We don''t know if SH could swim or not. I thought she died from being pushed into the water too, but it was just a pond and didn't look very deep. I'm not sure if that killed her or not. Evil mother probably had something to do with it too. Although, she seemed surprised, she could have been faking it in order to hold it over the Emperors head. She is very conniving. Also, when WS's mother was killed, the Emperor seemed to be really upset and remorseful. I can't understand him sometimes. He has a really bad temper but can be so sweet and sometimes seems innocent. The actor is doing an amazing job with this role. Thanks so much for the long preview! anyone know what they’re saying? In an earlier episode, YR goes to the morgue/hospital and finds out that WB's mother's body is gone and it appears that he was the one who took the body. Then, she goes back to her car and sees his mother's spirit in the backseat. So, what happened? How would she then get the body and dump it by the river? I was really confused on that part. Also, the nanny clearly has been plotting ever since she came into the palace. My guess is she liked the emperor, but he only had eyes for the empress. So, she decided to befriend the empress and gain her trust. Then, once he saw that she and the empress were bff's, she got closer to him. She then planted the seed in his mind that she was cheating. The former empress was friends with her guard, much like Sunny and WB. She got the emperor paranoid which led to her death. After which, the nanny swooped in the comfort the emperor and she slept with him and made a love child. She's scary. Then somehow, she made a connection with the prime minister, all for what? To be in the Imperial family??? I think Empress SH died when LH pushed her into the water. Yes, the water was not very deep, but a person can drown in a cup of water. First, he choked her, so she's already having trouble breathing. Then he pushed her. She was wearing a full hanbok with all the petticoats and underlayers and let me tell you, the real traditional hanboks (not the more modern ones with zippers) are not comfortable. They are extremely bulky and she seems to be wearing the heavier winter weight. That's a lot of material to get waterlogged, and the Empress looked heavily pregnant and she would have difficulty righting herself when she fell backward into the pond. It could be that the pond is just deep enough that she's not really touching bottom when in a prone or sitting position that she is able to push herself upright. I think that LH pushed her and started walking away and then ran back when he realized that the splashing had stopped. And, instead of running in then to help her, he just stared at her. Also, when WS' mother was first hit by LH's car, LH's first and immediate reaction was annoyance, not OMG what did I just do. In LH's defense, he wasn't in the right state of mind when he pushed her into the pond. That's what I think. He should have owned up and grieved for his mistake, which actually he did think he killed her and blamed himself. It was the ED who kept telling him otherwise and tried to cover it up. I know a lot of fans like the chemistry of emperor and Sunny thus they want they end up together and put so many excuses for what he has done such as miseducation, pressure etc. But, guys...his brother is not as crazy as him. I understand the impact of his mother's influence fully. But still, he's mentally weak. That's why he just follow what he wants and what his mom's said. See, when he killed WS's mom, Yura was the one helping him out. When he tried to kill his late wife, his mom came and comforting him lol... I'm sure when he knows Sunny secretly in love with Wang Sik, he also try to force her. If Sunny should end up with someone, it should be Woo Bin because he was the one who always protects her from the beginning even that time he didn't have any feelings for her at all. For me, I wanna know all the mystery they have in the drama before we get too many romance. If I recall, that "empress" ate poisoned persimmons first and then I think her body was dumped in the pond to make it look like a drowning. Also, wasn't it the empress' sister? Your mum will scold you ! I hope she’s still enjoying this drama . What does she think of LH - Sunny - WB brewing love triangle? She is! haha i dont think she really cares about the love triangle though.. she is obsessed with finding granny’s murderer.. .. we both think lee hyuk is really killer and he lied to his mother about what really happened that night..
Ahh that’s possible especially after what the nanny said,I’m still unsure who it is but it could very well be like the Murder on The Orient Express , where a few had a hand in her death. 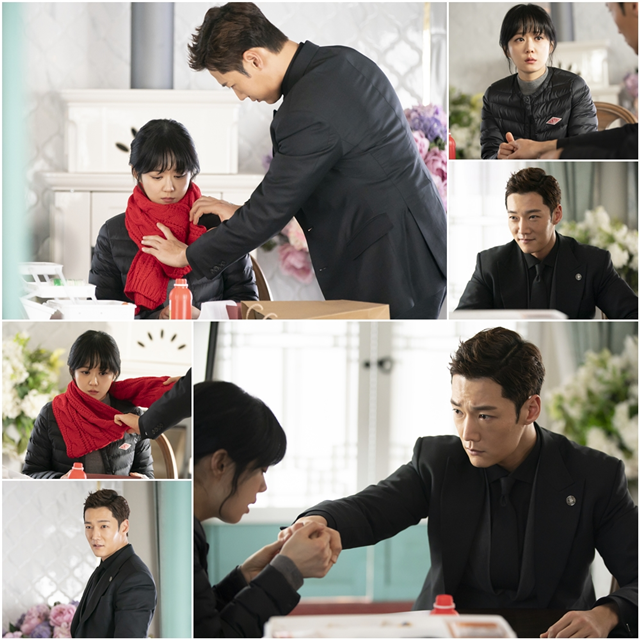 New stills ..oh sbs is selling the love line or just trolling with our hearts?